Cross-country skis are one of the most iconic and most popular varieties of skis. These skis are the narrowest and longest, and are ideal for cutting through un-groomed backcountry fields and steep ski tracks alike. Unlike other varieties of skis, cross-country skis have an unfixed heel for greater control. The best beginner cross-country skis are flexible and lean toward a wider style for greater flotation and control. 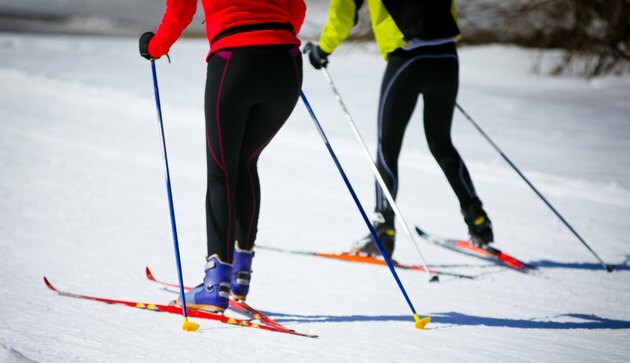 A flexible cross-country ski is more forgiving if you're new to skiing; a stiffer ski is much more responsive, amplifying any mistakes in your technique and making basic beginner moves like wedge turns more difficult. Look for a ski with a good camber, which is a measure of the slightly convex curve in the middle of the ski, underneath the binding. Your boots and bindings work in similar ways; flexible boots won't give you the precise control top skiers demand, but the comfort and ease of use are great trade-offs for beginning skiers. Since many cross-country ski tracks have strict limits on what types of cross-country skis you can use, you're best off getting a ski under 70 millimeters in width without a metal edge. Going wider is usually preferable for new skiers, since a wider ski will give you a bit more control and flotation on unconsolidated snow. This lets you trek into the backcountry when the groomed tracks fail to satisfy. A cross-country ski that excels for different types of skiing will let you decide what your preference is. What Is a Directional Twin Snowboard? Should I Ride a Wide Snowboard?